A lender wants to give out low risk loans which is why it looks at your credit and employment history to get an indication of what kind of borrower you are. Keep reading to learn about the factors banks typically evaluate to determine your personal loan eligibility. Once you know what’s expected, start looking for the best personal loan rates available. The lender’s credit check reveals your credit score, an important factor in determining your personal loan eligibility and your interest rate. Make sure your score is as strong as it can possibly be. You are entitled to a free credit report each year from all three credit reporting agencies — Experian, TransUnion and Equifax. Get each credit report and check for and address errors that might impact your score. Your credit card issuer might give you access to a free credit score. You can give your score a quick boost by paying off a portion of debt and asking for a credit-limit increase on current cards. Both of these actions improve your credit utilization ratio, the amount of debt you have divided by your credit limit, which can account for up to 30 percent of your credit score. Other important factors lenders look at are your current source of income and your monthly expenses. Even if you make a substantial amount of money, lenders look at how much debt you’re responsible for on things like credit cards, car loans and mortgages. The lender might also consider your regular monthly bills, alimony and child support. Lenders use your income to determine your debt-to-income (DTI)ratio which equals your total monthly debt payments divided by your gross monthly income. For example, a borrower with $3,000 in monthly income and $300 in monthly debt payments has a DTI ratio of 10 percent. Lenders like to see a DTI ratio of no more than 43 percent, which is the maximum mortgage lenders allow their applicants to have. Don’t confuse a DTI ratio with a loan-to-value ratio; your LTV ratio is your mortgage loan amount divided by your home’s purchase price or appraised value. Lenders want to see established proof of ongoing income and employment stability. Applicants who change jobs frequently or are self-employed pose bigger risks for lenders. A good employment history doesn’t necessarily mean you’ve stayed with the same company for several years. Rather, lenders want to see that you have stayed in the same line of work and that your line of employment has been stable. Self-employed applicants receive closer scrutiny by lenders. You’ll need to provide more in depth information to establish a history of reliable income if you work for yourself. Equated monthly income is the calculation that tells you what your monthly loan payment needs to be in order to pay off your mortgage or other loan on time. You and your lender both need to know this number because it indicates whether you can afford a loan’s payments on your current budget. A borrower’s EMI amount depends on the interest rate and the length of the loan. In addition to checking your credit score, lenders check your credit history and loan repayment history. Unpaid debts can linger on your credit score for up to seven years which can hurt your score and affect your loan eligibility. Try to lessen the impact of late payments by writing a goodwill adjustment letter to creditors asking them to remove late payment records. Some lenders factor in the amount of the loan and what you plan to do with the money. For example, you might have an excellent credit score and source of income, but the loan amount could be too risky for a lender to take on. A lender might also consider your length of residency and relationship with the bank. Your personal loan eligibility is determined by many different factors. Using a personal loan eligibility calculator will help you see if you’re a good loan candidate before you apply for a personal loan. Once you secure a loan make your loan payments consistently and on time so that the next time you need a loan your lender will be there to help. Ashley Eneriz contributed to the reporting for this article. If you want to know how to get a mortgage with bad credit, you’ll first want to know if your credit score is actually considered bad. 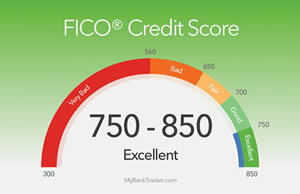 A "poor" FICO score is 579 or lower. Loans for people with bad credit, though higher in costs, are available through various lenders. Here are some ways to work with lenders that offer what are known as bad credit loans at subprime rates. There are many banks that offer what are known as FHA loans. These loans, insured by the Federal Housing Administration, aim to increase homeownership among Americans. A quick google search for "FHA loans for bad credit" will yield many bank options in the search results. Make sure Google knows your location to increase local search results. FHA loans are available to people with a credit score as low as 500. If your credit score is between 500 and 580, you’ll need at least 10 percent down. If your credit score is bad because you lack sufficient credit history or just have never really used credit in your life, you might be a candidate for manual underwriting. This means a human will review your file and consider other mortgage-qualifying factors aside from your seemingly poor credit score. Banks that offer these loans will still want documentation on your work and income history along with alternative credit tradelines like cell phone bills, utility bills or rent payments. Portfolio loans are common in smaller, local community banks and credit unions. With a portfolio loan application, you’ll have more leeway to explain why your credit score is low or the circumstances surrounding your recent bankruptcy filing on your credit report. The underwriters will consider this additional information and make a decision based on circumstances beyond your FICO credit score. Veterans Administration loans are designed to help service members, veterans and eligible surviving spouses become homeowners. Though lenders offering VA home loans typically want to see credit scores of 620 and above, it is not unheard of for some lenders to extend loans to borrowers with scores as low as 580. You may have to shop around to find a bank that will offer a VA loan for those with lower credit scores, but it’s not impossible to do. As you can see, those with higher credit scores will get the best rates and pay the least for mortgages over the lives of their loans. Though it’s possible to get a mortgage with bad credit, another alternative is to take some time to improve your credit score. The money you’ll save as a creditworthy candidate will be well worth the wait and effort.